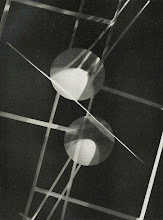 A few weeks ago, I came across the photo above on someone's Tumblr or Flickr or Friendster page. OK, it wasn't Friendster. After a little research I was able to confirm that it was photographed by James Burke for Life magazine some time in 1956. I say "some time" as I have found that the dates are not always accurate in the Life archives, so although it claims December of that year, let's not etch that in marble. OK? At first glance, there is SO much to just plain dig going on here: jazz musicians, abstract expressionist art, loafers, desert boots, and people just having a good time. I posted this shot on my Facebook wall which illicited some positive comments from like-minded souls the world over. It's just a neat encapsulation of why so many of us continue to dig deep into the past for inspiration. So let's dig a little deeper. 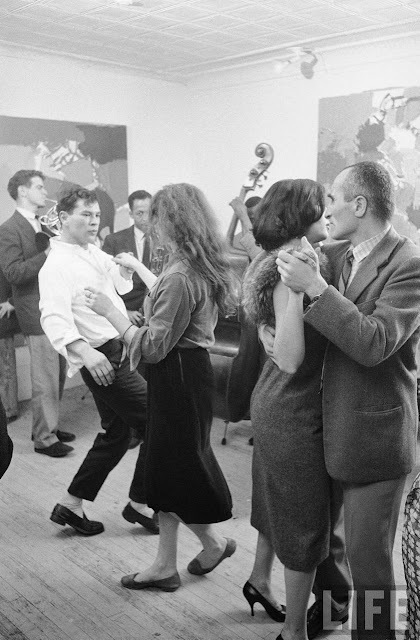 The main subject of the photo (at least in terms of the assignment Burke was on for Life) was artist Milton Resnick who can be seen dancing with the brunette in fur and heels to the far right of the photo. Resnick has a fascinating biography and in art historian circles is considered one of the major figures of Abstract Expressionism. 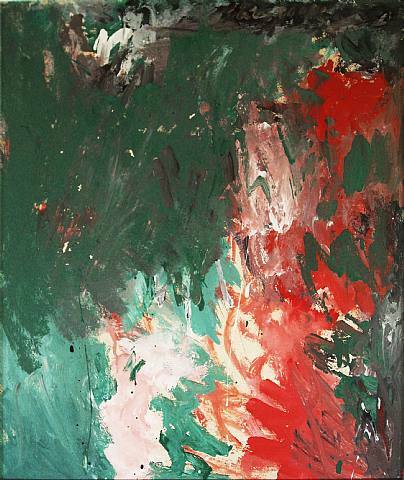 Curiously, his posthumous popularity has sagged in recent years and he is seldom mentioned in the same breath as Pollock, de Kooning, or even (my personal favorite) Kline. But he was a big part of the 10th Street scene of the 1950s and 1960s. The 10th Street thing was a loose collaborative of artists and galleries located on the Lower East Side on and around East 10th Street in Manhattan. 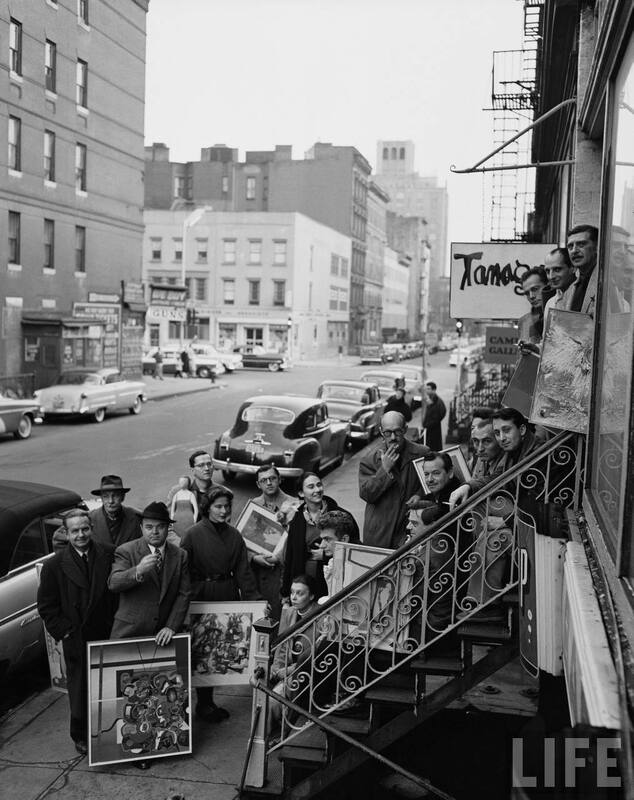 Some, like the Phoenix Gallery, still exist but for the most part they thrived from roughly 1952 to 1962. Live/work space was plentiful and rent was cheap, so many of the more progressive artists of the day gravitated to the locale and provided a significant alternative to the upmarket Midtown galleries. Long before SOMA. Long before Chelsea. Note: I wish I could identify more of the artists in the photo above. In addition to Resnick , the only one I am fairly sure of is Franz Kline (black hair and 'stache). If you recognize others, please leave a comment below! Back to the main photo. I am fairly confident that the man blowing the French horn is David Amram. Cast your peepers on the photo above shot a year later at the Five Spot Cafe (which is located just a few blocks South of E 10th in the Bowrey at 5 Cooper Square). Same guy, right? If you ain't hip to Amram, get hip. 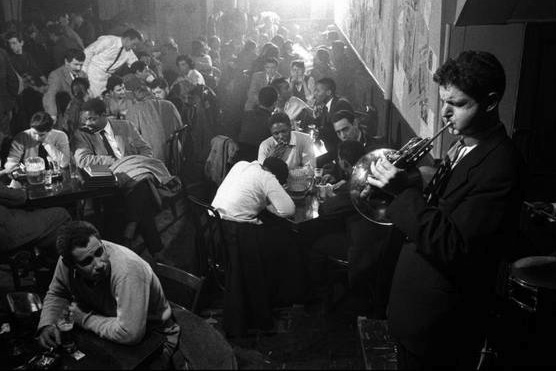 Not only did he have some serious Beat Generation ties back in the day, but he is still going strong in 2011 performing monthly at the Cornelia Street Cafe in Greenwich Village; a living link to the past. I'm only slightly going out on a limb when I say the remainder of the group performing at Resnick's house party is the Amram-Barrow Quartet. 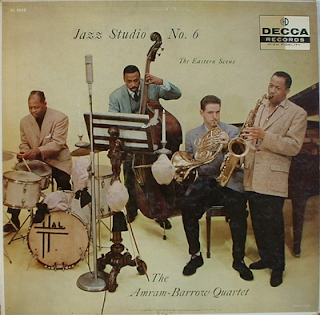 Tenor sax man George Barrow hooked up with Amram in 1955 by way of Charles Mingus. The group was rounded out by Arthur Phipps on bass and Al Harewood on drums. 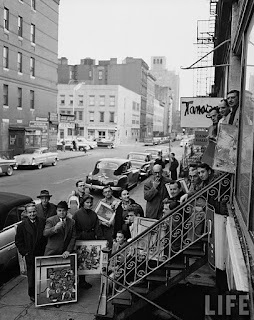 They were regulars at The Five Spot and recorded for Decca Records in 1956 or 1957. Of course, this all makes sense as The Five Spot was a favorite of the 10th Street crowd. One final note of admiration regarding the photo. As I mentioned before, be sure to check out the clothes. It's such a cool mix of Bohemian, Ivy League, and contemporary fashion styles of the time. It's always eye-opening to see real candids from this time period (as opposed to movies or magazine ads, that is) to see how folks really dressed. Only Gerry Mulligan made wearing desert boots while blowing a horn look cooler! Legendary Ivy League haberdasher J.Press (started in 1902 on the Yale University campus - a fuller account of which can be found here) are currently stocking their contemporary equivalent of an obscure but iconic piece of clothing: the Ivy League trouser. 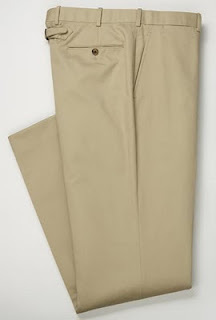 It's available in both tan cotton twill and charcoal super 110 worsted wool. How do they shape up? We'll get to that in a moment, but first what the hell is an "Ivy League trouser"? 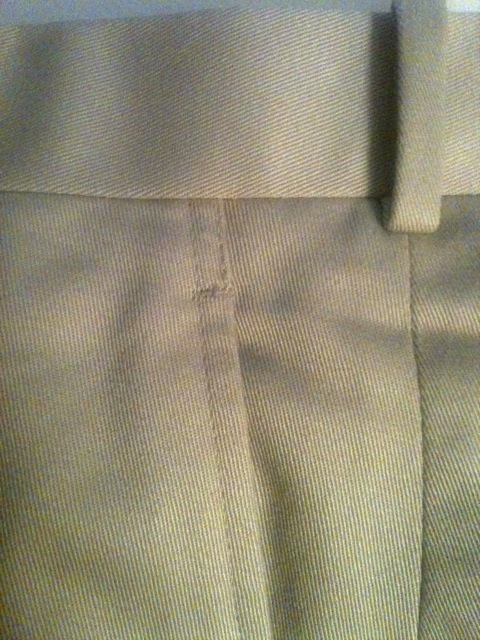 The notion of putting a cinch or buckle on the back of men's trousers just below the waist was not an Ivy League invention. In fact it goes back at least to the late-1800s as partly evidenced by Levi's Vintage Clothing's recent 1878 reissue (above). It is a detail that crops up every few years in the early 20th Century, but by the end of the Second World War it was a trend that had not been revisited since perhaps the 1930s. 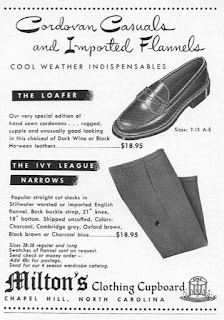 Sometime in the early-1950s, clothes-makers re-introduced the detail as part of the emerging post-war "Ivy League" trend. 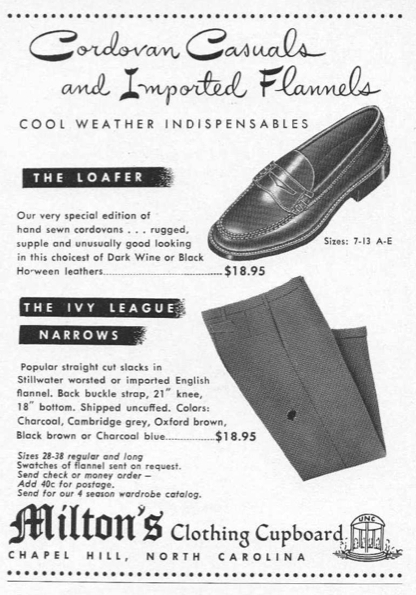 The above ad is from a 1954 issue of Gentry and is the earliest reference to this detail in the Ivy context I have seen so far (source: Ivy Style blog). Most photographic evidence of the back buckle from this era shows its presence on chinos, so it is especially interesting to see this ad mention both worsteds and flannels. The back buckle (often referred to these days as a "buckle-back") became so synonymous with Ivy style that "Ivy League trousers" became the generic term for any flat-front, straight-leg trouser with this detail - although it did most often refer to chinos or polished cotton twills. The trend itself lasted almost 10 years. By the early 1960s the trend seems to have gone to the wayside, yet again. If you are interested in a good discussion of the matter, follow this link. Historic side-note: I just recently learned that chinos were also known as "suntans" early on - particularly by WWII and Korean War vets - obviously the moniker did not stick (see the below 1956 illustration for a reference). But let us return to the present. 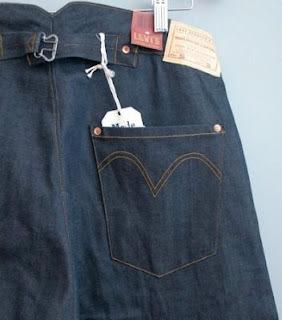 Back in June 2009, the Ivy Style blog carried this piece on the back buckle. And although it took a couple of years, retailers did pick up on the detail. There are a couple of options out there. NYC's Thoroughstitch has produced a very handsome pair of chinos - unfortunately the initial run is sold out and they've been unable to give me an indication of when it will be re-run. Somewhat surprisingly, Levis brand Dockers is doing a version - although the rise is (not surprisingly) geared towards a more contemporary crowd that doesn't quite seem to know where a man's waist is located. Regardless for the right body shape and weight, this US-made garment could be a good, affordable option. Which brings us back to the J.Press trousers. They too, are made in the USA - by Martin Greenfield, no less, for Press. Good news indeed. The polished cotton twill is a step-up from the military-style Cramerton cloth chinos of which there are so many good options to choose from these days. Nearly perfect for dressing up without looking like you are adhering to casual Friday conventions. They sit at the true waist - perhaps a little high for some (at first) and with no concession to current mainstream trends, but they look good (and, dare I say right) when paired with a button-down and odd jacket. There are some nice details. The slanted pockets drop about half-an-inch from the 1.5" waist-band, which is a detail typically only seen on some vintage items. The straight-leg width measures 10" at the knee and just over 9" at the cuff, which certainly puts them in the provenance of "classic" if you read books such as these. 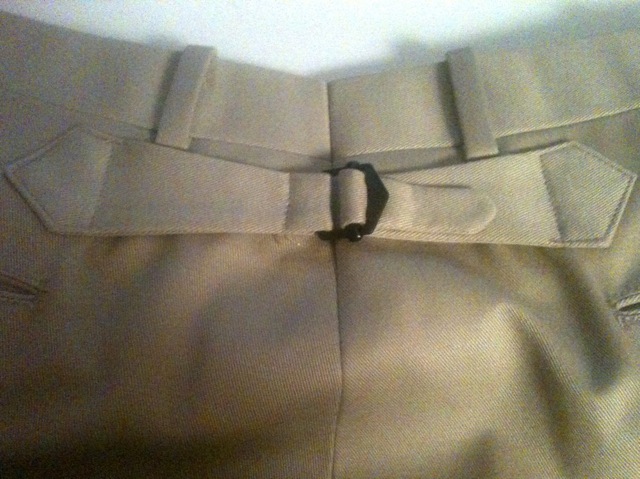 Postscript: if you have read this far, might I recommend this link for a little more on the origin of the buckle on khaki chinos.